May these Words of Wisdom, light your journey and leave footprints of love in your heart bringing you hope, joy, happiness and health in body, mind and spirit. Astonishingly enough current research shows that 90 to 95% of all dis-ease is caused by stress which in it's own right causes emotional and sometimes even spiritual upheavel... does that surprize you? What's even more fascinating is the fact that a lot of ailments manifesting in your physical body is often deeply rooted at the emotional or spiritual level of your being. That goes to prove that you are more than flesh and blood... you are body, mind, emotion and spirit. This is where Energy Healing steps into the picture as it addresses the root causes of dis-ease on all levels of your being, getting straight to the heart of these stress, emotional and spiritual based problems. C. Norman Shealy, M.D. - "Energy medicine is the future of all medicine." Mehmet Oz, M.D. - "...the next big frontier... in medicine is energy medicine." If you haven't yet stepped into the future or crossed over into the next frontier, you're in luck. Immerse yourself in the amazing world of energy healing and discover how energy healing gets right to the core of your most pressing health issues. After you've completed these courses, you'll not only understand why and how Energy Healing works but you will also experience first hand how it can work for you. 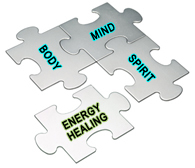 Learn Energy Healing - ENROLL NOW! New Release - HJE Pocket Book Series! Crystal Healing eBooks - Study Tools and Aids ... All for under $5! Go here Now and WIN "Know & Heal Yourself - A Course in Crystal Healing" receive the formula to AWAKEN your "TRUE SELF" with the Astonishing Power of Crystals... AND... open yourself up to a whole new life experience TODAY! With a little self-confidence, success-minded motivation, a little creativity, a winners attitude, some effective communication and positive thinking, properly organized, we can make order and clarity out of any chaotic set of circumstances. Healing is a journey... the destination is YOU!